Have we found the mass graves of Jews murdered in Eastern Europe? The Einsatzgruppen and their collaborators murdered Jews throughout Eastern Europe as they made their way into the heart of the Soviet Union (Operation Barbarossa); the Nazis occupied Lithuania, Latvia, the Ukraine, Crimea, and other Soviet controlled areas after June 1941. There are thousands of mass graves filled with the remains of murdered Jews. As of 2013, a project of Yad Vashem has documented 1,590 mass graves in part of the Ukraine alone. Father Patrick Desbois, who is dedicated to documenting the murder of the Jews in the Ukraine, had also located and documented mass graves. Contrary to the claims of Holocaust deniers, there was no “missing” mass grave at Marijampole, as inaccurately reported in one newspaper article from one Lithuanian newspaper. The mass grave was found 300 feet away from its anticipated location. It turns out the grave was not “missing” after all. The authorities found it 300 feet away from the original site they investigated. A memorial was erected there. Holocaust deniers have not publicized this fact, using Marijampole as their primary example of a “missing” mass grave. There are thousands of mass graves throughout Lithuania, Latvia, the Ukraine, Crimea and other areas of the Soviet territories. Yad Vashem is conducting a project to identify the mass graves in an area the Nazis called Reichskommissariat Ukraine (about 1/6 of the land area occupied by the Germans). The project is ongoing but a partial list for just the Reichskommissariat Ukraine contains over 1,500 identified mass graves (as of February 2013). The list details the GPS coordinates, the name of the town or murder site, and a description of the execution(s) committed there. More specifically, the Yad Vashem report divides the Reichskommissariat Ukraine into 17 districts. To take an example, one of 17 districts on their list is the Zhitomir district, containing both the city by the same name and surrounding areas. In this Zhitomir district, Yad Vashem has identified 105 mass grave sites, including sites in or near the towns of Andrushevka, Baranovka, Barashi, Bazar, Berdichev, Chernyakhov, Chervonoye, Chudhov, Dzerzhinsk, Khodorkov, Kolodyanka, Korosten, Lyubar, Miropol, Novograd Volynskiy, Radomyshl, Ushomir, and Yanushpol (among many others). This is only a partial list of the towns and executions sites in the Zhitomir region. 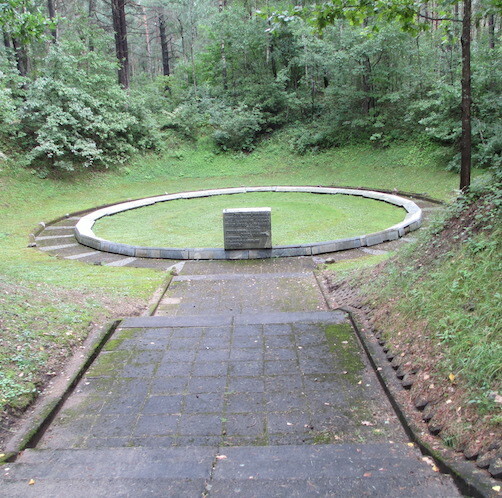 Aside from the Yad Vashem project, a postwar Soviet commission, the Extraordinary State Commission, found six mass graves in the forest area near the town of Zhitomir. They exhumed 962 corpses of both sexes and various ages. In another area near the town they found 13 mass graves. They opened these as well and examined the bodies. They estimated there were no less than 20,000 bodies in these graves. The Commission dug up the actual graves and physically counted and forensically examined the bodies. Father Patrick Desbois, a Roman Catholic priest, travels the Ukraine searching for the mass graves of murdered Jews. He has found that 65 years later the face of the land can change dramatically, making it hard to locate a specific grave even if a general area can be deduced. Sometimes only a minor settling of the ground indicates the presence of a mass grave. The Nazis did not document the sites of their crimes particularly well; in fact, they spent a great deal of time and energy trying to relocate them later. Why? As the Nazis were retreating from the Soviets, they wanted to dig up the graves and cremate the bodies to destroy the evidence. This activity disturbed mass grave sites even more and sometimes made the exact location of such sites harder to find. Mass Grave in Ponar. By Avi1111 – Own work, CC BY-SA 3.0, via Wikimedia Commons. Physical evidence, eyewitness testimony, and Nazi German documents prove that there are thousands of mass graves in the East. Overall, the East is the final resting place of 1,150,000 Jews. A single newspaper article about the difficulty of finding one mass grave does not constitute historical evidence. The use of inaccurately analyzed, anecdotal evidence is a common Holocaust denier strategy. This is not good history, nor does it hold logically. Meanwhile, Holocaust deniers demand that responsible, trained historians produce reams of documentation and physical evidence down to the tiniest detail. They then demand that witnesses to events in the 1940s have absolutely no slip in memory or differing perspectives. According to deniers, if there is one iota of difference between eyewitness accounts, then someone must be ill-informed or lying. It is highly unlikely that they would hold friends or family to the same standards of absolute perfection for events that they witnessed 25 years ago, let alone 70+ years ago. Instead, Holocaust deniers accept one single newspaper article about one small Lithuanian town as proof of their assumption that the Einsatzgruppen did not murder 1,150,000 Jews. The mass grave in this Lithuanian town has since been found (300 ft. away! ), but Holocaust deniers do not rush to correct their mistake. Carlo Mattogno and Jürgen Graf, Treblinka: Extermination Camp or Transit Camp? (Theses & Dissertations Press, 2004), p. 226 at http://vho.org/dl/ENG/t.pdf. Germar Rudolf, “The Controversy about the Extermination of the Jews: An Introduction” citing the Lithuanian newspapers Lietuvos Rytas, August 21, 1996 at http://www.vho.org/GB/Books/dth/fndintro.html#ftn145. Jürgen Graf, “Raul Hilberg’s Incurable Autism” (“Hilberg’s Documentation Problems”) at http://www.vho.org/tr/2003/3/Graf344-350.html. For an excellent account of this massacre see Lithuania: Crime & Punishment, #6, January 1999, pp. 79-81. Karl Jäger, Report dated December 1, 1941 at http://fcit.usf.edu/HOLOCAUST/resource/document/DocJager.htm. You may read the report, “Online Guide of Murder Sites of Jews in the Former USSR” at http://www1.yadvashem.org/yv/en/about/institute/killing_sites_catalog.asp. See Yad Vashem “Online Guide of Murder Sites of Jews in the Former USSR,” Zhitomir section at http://www1.yadvashem.org/yv/en/about/institute/killing_sites_catalog_details_full.asp?region=Zhitomir. In an area corresponding to part of the current county of Ukraine they have discovered the following by region: Chernigov, 23; Dnepropetrovsk, 23; Kamanets Podolsk, 92; Kharkov, 60; Kherson, 6; Kiev, 12; Kirovograd, 5; Lwow, 70; Nikolayev, 53; Poltava, 20; Stalino, 35; Stanislowow, 99; Sumy, 33; Vinnitsa, 86; Voroshilovgrad, 15; Wolyn, 164; Zaporozhye, 61; Zhitomir, 95 for a total of 952. These are only the ones they have discovered and marked. In 8 regions of Belarus they have discovered and marked 646 mass graves. This does not include the rest of the countries the Germans overran, including Lithuania, Latvia, Estonia, etc. Roberto Muehlenkamp, “Neither the Soviets nor the Poles have found any mass graves with even only a few thousand bodies . . .” at http://holocaustcontroversies.blogspot.com/2006/07/neither-soviets-nor-poles-have-found.html. Yitzhak Arad, Shmuel Krakowski and Shmuel Spector (editors), The Einsatzgruppen Reports: Selections for the Dispatches of the Nazi Death Squads’ Campaign Against the Jews in Occupied Territories of the Soviet Union July 1941–January 1943 (Holocaust Library, 1989), p. 79. Yitzhak Arad, Shmuel Krakowski and Shmuel Spector (editors), The Einsatzgruppen Reports: Selections for the Dispatches of the Nazi Death Squads’ Campaign Against the Jews in Occupied Territories of the Soviet Union July 1941–January 1943 (Holocaust Library, 1989), p. 135. See also http://www.holocaustresearchproject.org/einsatz/situationreport17.html (Operational Situation Report USSR No. 17). Yitzhak Arad, Shmuel Krakowski and Shmuel Spector (editors), The Einsatzgruppen Reports: Selections for the Dispatches of the Nazi Death Squads’ Campaign Against the Jews in Occupied Territories of the Soviet Union July 1941–January 1943 (Holocaust Library, 1989), p. 174. See also http://www.holocaustresearchproject.org/einsatz/situationreport106.html (Operational Situation Report USSR No. 106). Ernst Klee, Willi Dressen and Volker Riess (editors), “The Good Old Days”: The Holocaust as Seen by Its Perpetrators and Bystanders (Free Press, 1988), pp. 115-116. Ernst Klee, Willi Dressen and Volker Riess (editors), “The Good Old Days”: The Holocaust as Seen by Its Perpetrators and Bystanders (Free Press, 1988), pp. 117-119.